I’ve written about the importance of leaders being passionate about their missions, and how they can develop passion if it starts to fade. Passion is important because passionate people find joy working in their areas of passion, and when doing so, they are highly motivated to achieve excellence in their work. Well, if it is that important for ministry leaders to be passionate, then it is also important for staff to be passionate too! So let’s discuss helping staff find passion in their ministry’s mission. Recognize that when you hire people, they choose to work for you for their reasons, not yours. In some way, the job or role you offer helps them achieve what they want. So if you want passionate people, it starts right at the beginning of the selection process. It is important that people want to work for your cause. In the best-case scenario, they are deeply attracted to your particular mission. It might be acceptable if they are attracted to the cause of Christ more generally and see your ministry as a way of fulfilling that aspiration. But depending on how demanding your ministry’s mission is (for example, requiring relocation to a difficult area) that more general attraction might not be enough. One of the questions I ask job candidates is, “When there are so many ministries you can apply to, what is it about CCCC in particular that caused you to apply for this job?” There are some other questions that address the issue in a more roundabout way, but together they give me a good understanding of how we fit into their career plans. The nature of the work determines whether this question is a make or break question. The goal in hiring is to match people to jobs that appeal to their passion, give them great joy, and that they can do with natural excellence. To have a wonderful workplace where everyone is enthusiastic and seriously engaged with their work, craft jobs to suit them. Jobs and their responsibilities need not be cast in stone. Various responsibilities and tasks can be shifted from one job to another based on the preferences and interests of the incumbents. At CCCC we have many times shifted something from one person to another with the agreement of the two people involved, at both management and administrative levels. I love to hear someone say how much they enjoy their work! What might be a chore to one could be a joy to another. The systemic conditions which your mission challenges, such as those which entrench poverty or make it difficult to get homeless people off the street. Paint the big picture of the impact your ministry is having. Tell stories of individuals whose lives have been improved by your ministry. 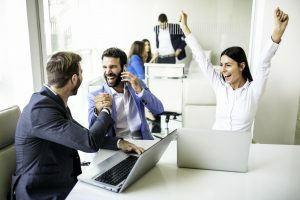 Celebration can be a large, planned, formal event or it could be a spontaneous “high-five” as you encounter someone in the hallway who has just enjoyed a success. Celebrations should always be based on some specific achievement and the degree of celebration should be linked to the significance of the achievement. Otherwise, celebrations will be seen as manufactured celebrations and become meaningless. Celebrations can either relate to the mission, or to an individual or group of individuals. Mission-related celebrations recognize progress in mission fulfillment, whether it is an output or outcome, or it is acquisition of a new resource to help you achieve the mission, or recognition by others of the good work you are doing. People-related celebrations recognize something significant that one of our workmates or a team of workmates, has accomplished. When one part of the body has a reason to celebrate, we all can support them by celebrating with them, strengthening the bonds between us. Their success encourages everyone because it means the ministry organization is better able to achieve its mission than it was before. It is a matter of good stewardship that leaders know their staff and volunteers just as a shepherd knows his sheep and calls them by name. The senior leader may not be able to know all the staff and volunteers well enough to be personally aware of their abilities and potential, but each staff member should be well-enough known by someone in leadership who will support their training and development to become everything that God intends them to be. Leaders should never consider a staff member’s development complete at the time of hiring. During their time under your leadership, it is your responsibility to enable them to keep on developing themselves, growing in skill and capability so that they can be excellent in their work. Finally, if you have passionate people working joyfully with excellence to fulfill your mission, don’t hinder what the Spirit is doing in them. Dave Blundell asks in his book Professionally Religious, “Do we, as leaders, trust the power of the Holy Spirit in the lives of followers?”1 Assume that the Holy Spirit is working in their lives just as he is in yours. 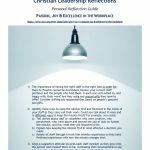 Cooperate with the giftings and experiences that God has given each staff member.